One of our customers came into the office recently. He wanted some online marketing ideas to help him reach his potential clients. I listened carefully, and then decided we needed to go old school to accomplish the goal. Yep, direct marketing, sent via snail mail. How to reach an elusive client at their time of greatest need? 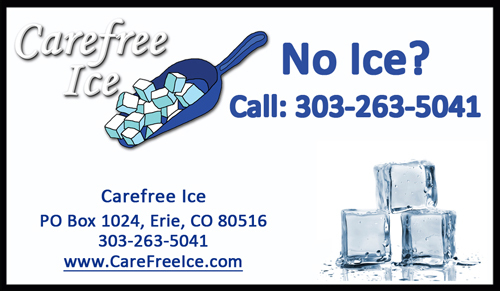 Carefree Ice is a Colorado-based company that leases and services ice machines. If you’re a restaurant, you need an ice machine. Without one, you can’t serve drinks. They’re expensive, though, at $5,000 each. And usually the only time you buy one is when you’re opening a new location, or it suddenly stops working. For new locations, our client has an existing referral network of realtors and building managers who hand out his card. So we decided to tackle the second problem first – an ice machine that suddenly breaks. 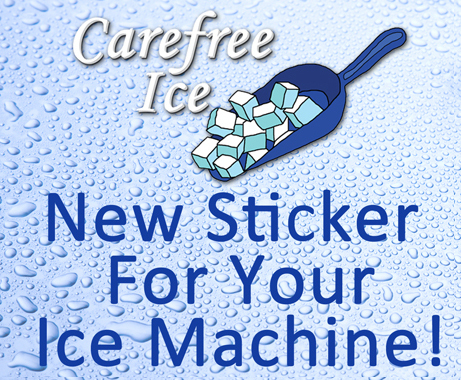 But how do you get restaurant owners and/or managers to call Carefree Ice when their machines stop working? I’ve worked in the restaurant industry in the past, and dealt with a lot of restaurants from a Website capacity. And one thing that I’ve found is that as a big generalization, most restaurant owners and managers are not very high tech. Disclaimer: some are very high tech. 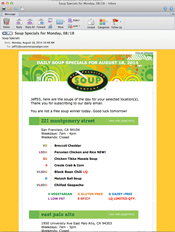 The San Francisco Soup Company is one of our clients, and we built a system that allows people to receive a personalized email, tailored to their geographic location, telling them what soups are being served that day. But that’s the rare exception. Restaurants are great at producing amazing food, delivering great customer service. They handle the soap opera drama of the staff. But it’s really hard work. Crazy hours. You can’t have an off night, or your customers won’t come back. When an ice machine breaks down, maybe they’ll turn to Google. It’s not to say we shouldn’t cover our bases and do a Pay Per Click Marketing Campaign, and optimize for particular keywords that someone might be searching for. But more likely, they’ll take their iPhone out of their pocket (the one in a waterproof case, because they work around food and liquids), and want to call someone to have it fixed. Or call their bookkeeper to make sure they had $5,000 in free cash lying around to buy a new one and have it delivered. Leasing one wasn’t probably top of mind. Understanding that a new ice machine could save $800 per year in water costs, as they are much more efficient, probably wasn’t at the top of their mind, either. Inside the End User’s Head… At Their Time of Need. Bingo! We were on to something. We’d gotten inside the head of the person at their exact time of need, and figured out what he or she would do. 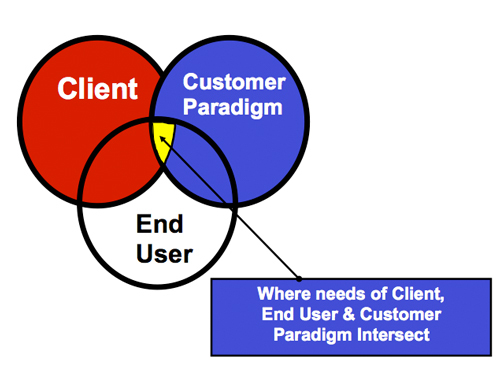 When I started Customer Paradigm, I started it with the notion that we could help businesses and organizations focus on the needs of their end customers, and design marketing interactions that create trust, confidence and loyal, long term buyers. 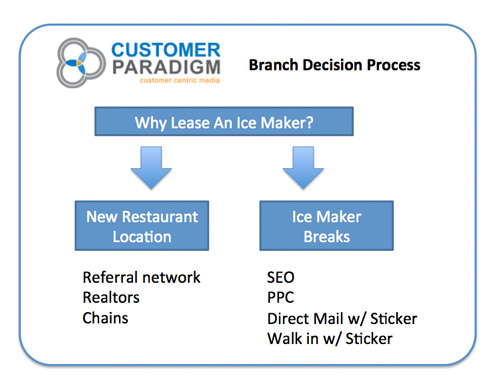 My meeting with Carefree Ice blended the Socratic method with a branching tactic, that in the end resulted in a likely scenario for a highly-qualified buyer. 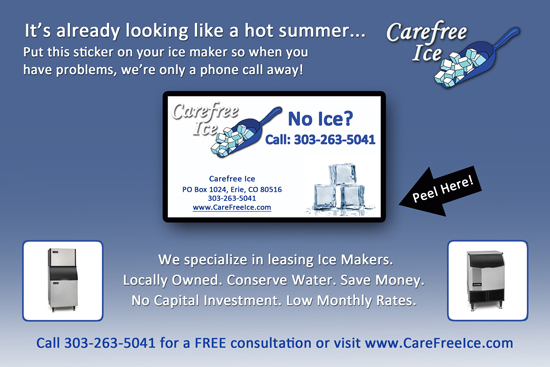 My initial idea: let’s put magnets with your contact information on the ice machines. Let’s write something like, "No Ice? Call Us!" The problem, though, is that these machines are all stainless steel. And what I forgot from my high-school chemistry teacher is that magnets don’t stick to stainless steel. They add nickel and chromium to the metal so it doesn’t rust. While some consumer-grade refrigerators work with magnets, industrial ones don’t. 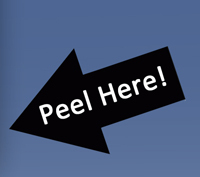 So… instead, a peel-and-stick sticker would have to do. Plus, stickers are less expensive to produce. The main message for the campaign: Place this sticker on your ice maker. If and when you have problems, call this number for service or a new unit. The design was big, bold and designed to "save" the postcard from being recycled (this is Boulder, after all) as soon as the business owner or manager saw it. We didn’t want to have to have anyone open an envelope, so we worked with a printing company that could produce a peel-and-stick sticker, right on a postcard (and still make it through the US Postal System). With a targeted list of 3,500 restaurants in the front range of Denver, Boulder and Colorado Springs, the mailing house took care of the printing, postage and delivery. Shawna on our team created the design, sourced the graphics and did all of the coordination with the mailing house. Unlike an online campaign, where ROI can be measured auto-magically, this campaign demands patience. Patience for ice makers to break, and then the phone to ring. This approach was counter-intuitive: Companies have largely abandoned snail mail campaigns and moved much of their marketing spend online. Because there is a lot less volume of snail mail going through the USPS, campaigns have a much better chance of grabbing attention and making an impact. 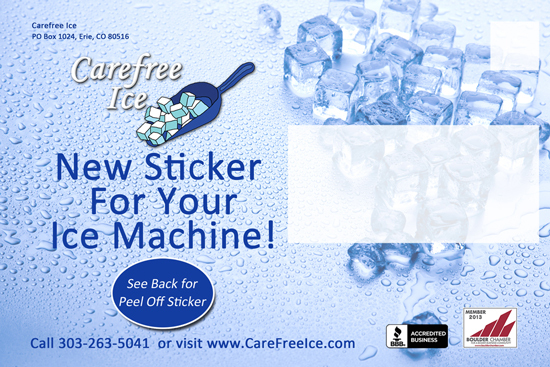 The follow up campaign for this is to have a few part-time students visit many of the more densely-packed locations and offer to put stickers on the ice machines. These students would also be able to report back on how many stickers were actually placed onto the machines. I wanted to focus on this case study, because it highlights our customer-centric approach. Using a branching strategy, we tried to get inside the head of the end customer at their time of need. And then we designed a campaign that would make it quick, fast and easy to connect them with someone who could help.